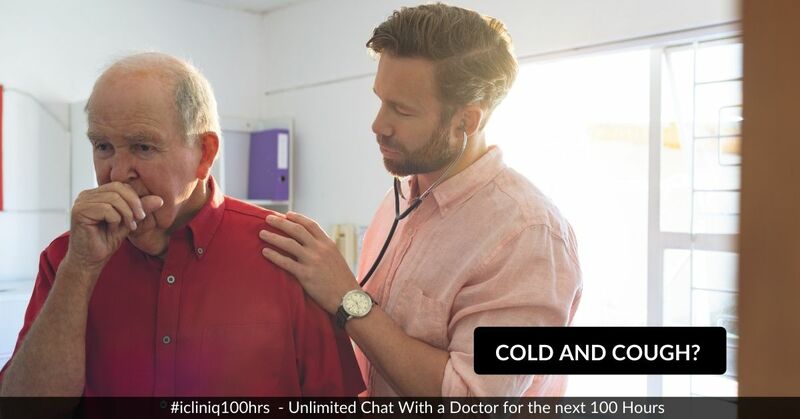 iCliniq › Ask a doctor online › Answers › Pulmonology (Asthma Doctors) › Asthma › How to cure my father's severe cold and cough? Q. How to cure my father's severe cold and cough? Answered by Dr. Amolkumar W Diwan and medically reviewed by iCliniq medical review team. My father is 66 years old. He is having severe cough and cold for more than a month. He took Clavam 625 mg for five days. Along with that, he also took Foracort 200 mcg inhaler twice a day and Nasonex inhaler twice a day, but there was no relief. Then, our chest specialist suggested Nebulizer with Budecort 0.5 mg twice a day for 15 days. After taking this too there was no relief. Then, he took Omnacortil 30 mg (Prednisolone) and Montair LC once a day for five days. He is prediabetic, but the medicines have not been started so far. Please suggest me some advice. • In chest x-ray, what is the meaning of bilateral apical inhomogeneities? • I have cold with chest pain and fatigue. Can it be due to pneumonia? Your father is suffering from bronchial asthma. The current medications Foracort 200 mcg inhaler (Budesonide and Formoterol) and Nasonex (Mometasone) nasal spray were given for asthma. As there is no relief even after taking tablet Clavam (Amoxicillin and Clavulanate) and tablet Prednisolone, it indicates that the dose of current inhaler is not sufficient. So, I suggest that it is important to increase the dose of Foracort inhaler to 400 mcg two puffs twice daily followed by gargling. I also suggest Levolin inhaler (Levosalbutamol) two puffs thrice daily and Benz pearls (Benzonatate) two puffs twice daily. Consult your doctor, discuss with him or her and then take the medicines with consent. My father has also developed fever 101 degrees Fahrenheit now. If he has a fever, then I suggest to take a chest x-ray to check pneumonia. I also suggest to do laboratory tests such as CBC (complete blood count), CRP (C-reactive protein), serum creatinine and RBS (random blood sugar). A week ago, he had a chest x-ray and it was normal. It is very important to do a blood test as fever itself indicates infection somewhere in the body. Asthma is a chronic disease affecting the airways. I suggest you to have regular follow up with your doctor as regular inhaler treatment is must for proper asthma control. How to recover from cold and fever?